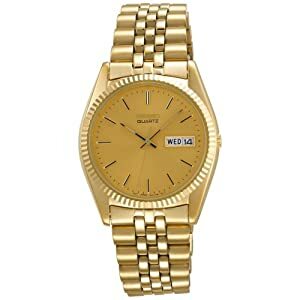 For the guy who wants a gold watch, this is a great choice. The Japanese quartz movement ensures perfect time, so he'll be on time and looking good with this stainless steel dress watch. Gold tones cover the watch - on the bracelet, fluted bezel, and dial. Luminous hands and markers help with a time check in low light. The water resistance is rated for 30 meters (99 feet). Many positive reviews compare this watch to much more expensive Rolex watches. At a fraction of the price of Rolex, it's definitely worth a look.